It’s a wrap – but which one should win healthy lunch off crown? 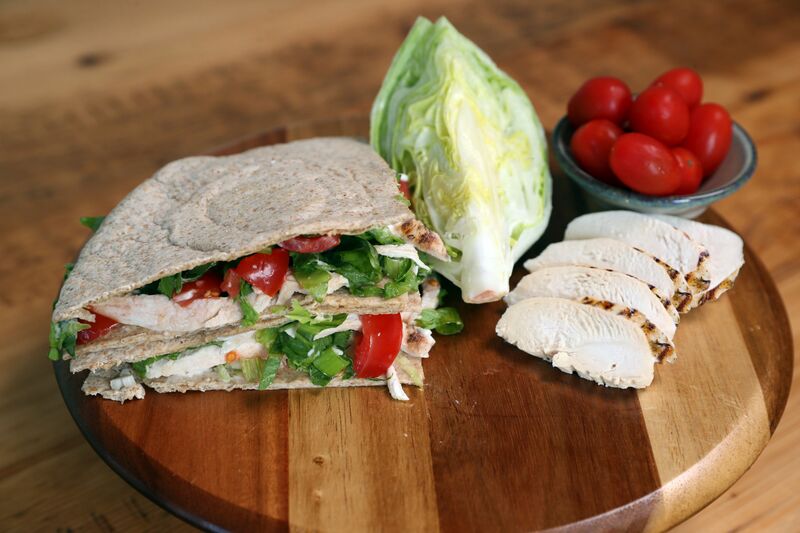 Home - Competitions - It’s a wrap – but which one should win healthy lunch off crown? L-R Centra Health and Nutrition Ambassador Jane McClenaghan, Translink’s Ursula Henderson and SuperValu Vegetarian Ambassador Sarah Patterson announce the finalists of the Healthy Lunch Off competition. SuperValu and Centra need you to cast your vote for the winner of Healthy Lunch Off Competition. 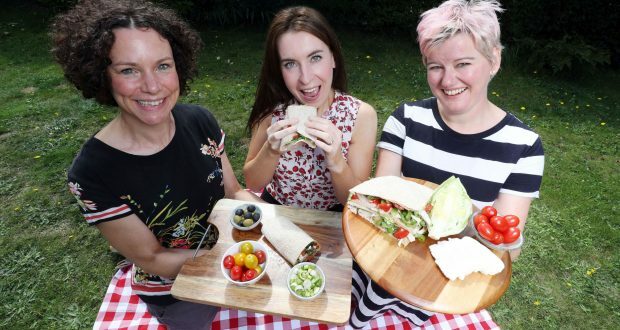 Two finalists have been announced in the Healthy Lunch Off competition, created by leading convenience retailers, SuperValu and Centra and public transport provider, Translink. The unique competition invited people across Northern Ireland to be active and enjoy the great outdoors by packing a healthy picnic and hopping on board the bus or train to explore some of Northern Ireland’s top attractions and beauty spots. Budding foodies were encouraged to get creative and come up with a unique, healthy lunch idea in order to win some fantastic prizes. Two creative takes on a classic wrap have been shortlisted and it’s now up to the public to decide who should win. 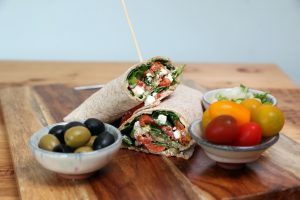 Lorraine Surgin from Co. Antrim’s ‘Mediterranean Metro Wrap’ (below), includes a mouth-watering mix of hummus, spinach leaves, sun blushed tomatoes, roasted peppers, scallions, olives and feta cheese in a soft tortilla wrap. Meanwhile, Barbara Campbell from Coleraine’s Cajun Chicken Wrap (below) brings a little spice to the palate, with sliced chicken fillet, shredded iceberg, sliced tomatoes, scallions, light Cajun mayo, seasoned with black pepper in a tortilla wrap. The public can now cast their vote for their favourite healthy lunch, via the SuperValu and Centra websites. Entries close on Wednesday 8th August. The overall winner will take home a cash prize of £500, along with Translink travel ticket vouchers and will also have their creation served in participating SuperValu and Centra delis for the whole country to sample. Part of the proceeds of the competition will be donated to SuperValu and Centra’s charity partner, Action Cancer. Commenting on the announcement, Desi Derby, Marketing Director, SuperValu & Centra said: “We are delighted with the healthy lunch ideas that have been shortlisted. Both creations are unique, healthy and easy to make in a hurry with accessible ingredients available at our Centra and SuperValu stores. To vote for your favourite healthy lunch, simply visit www.supervalu.co.ukor www.centra.co.uk by the closing date, Wednesday 8th August. For further information on the Healthy Lunch Off supported by SuperValu, Centra and Translink visit www.supervalu.co.uk, www.centra.co.uk and www.translink.co.uk.